Ever stopped to wonder what might be giving others the edge when it comes to health and feeling fitter? Time and time again we see patients coming through our office – looking to be feeling fitter with Singapore Chiropractic. We often explain how, through the application of gentle safe and effective Chiropractic Care – our doctors at ActiveLife Chiropractic are able to help patients not only feel better, but perform better too. When the spine is well adjusted it allows for the alignment of the joints to be restored. When the joints are functioning and moving well – they are able to work in the way they were designed. A healthy functional musculoskeletal system allows for better nervous system communication which in turn allows the body to do what it does best – heal itself. A fitter body is directly corelated with an optimally functioning nervous system. Through the application of Chiropractic care – the body can perform at it’s best. 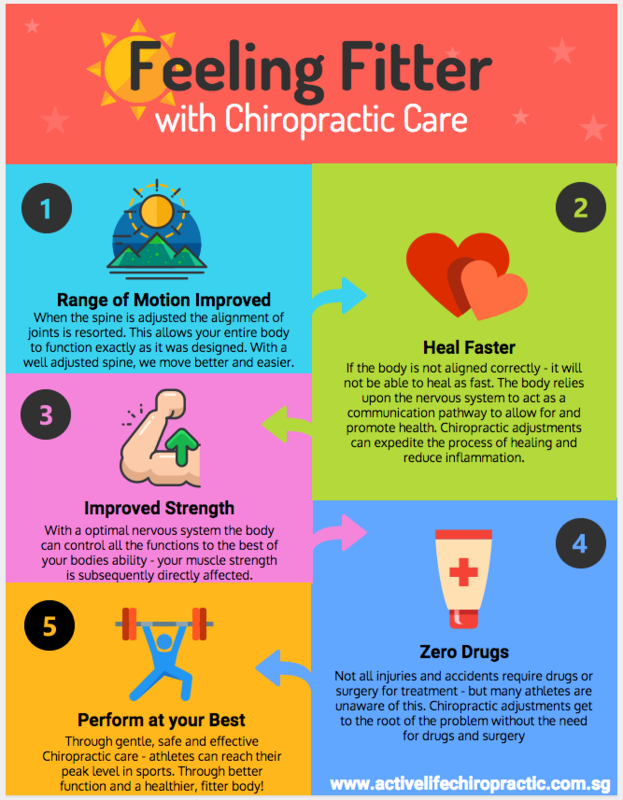 There is a reason why we are one of Singapore’s highly recommended chiropractor – come see for yourself. Our wonderful staff are always more than happy to assist with your enquiries.